ALS LID VAN DE NSVV KRIJGT U OP DEZE PUBLICATIE 66,7% KORTING! roadmap of questions in themed groups: Fundamental Processes, Daily Pattern, Longer Patterns, Application, Application – Specific, and Individual Differences. 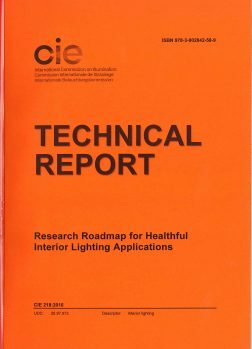 The roadmap indicates the ease with which each question might be answered and its importance to lighting application in the short term. Design considerations and the ethics of using light to influence health also receive attention. The publication is written in English, with a short summary in French and German. It consists of 47 pages with two figures and one table and is readily available at the National Committees of the CIE or via the CIE Webshop. The price of this publication is EUR 135,- (Members of the National Committees of the CIE receive a 66,7 % discount).